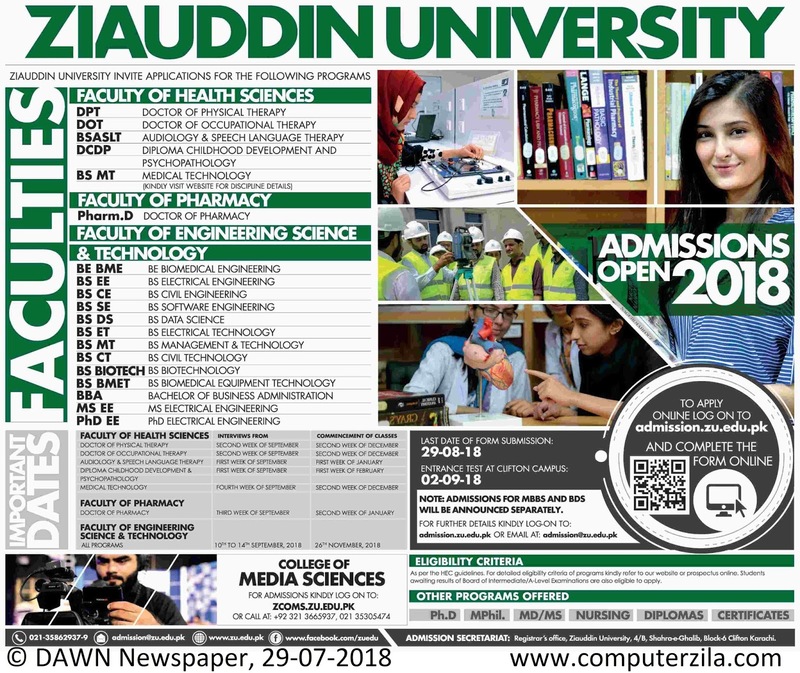 Admissions Open at Ziauddin University's Main Campus, Karachi for the batch Fall 2018. ZU offers admissions in different fields of study for Bachelor, Master and PHD Programs. University DescriptionThe Ziauddin University (ZU), is a private research university located in Clifton in Karachi, Sindh, Pakistan. The university is honored and named after the renowned educationist, Ziauddin Ahmad. Founded in 1995 by the Ziauddin Group who also managed its research and financial funding, it is one of the premium institutions of higher education. With a strong emphasis on medical, health, and biomedical engineering, the university offers undergraduate, post-graduate, and doctoral programmes. Due to its health research, it consistently maintained its high-ranking position and currently placed as one of the top institution in "medical category" by the HEC. In addition, its faculty and the university itself has taken initiatives to improve the health care system of Pakistan.